I've received a very interesting email forward recently. It has some stunning views of Lord Balaji of Tirumala, Tirupati. I don't think even the people who personally visit the temple are granted with such views. Really unbelievable how these photographs were taken despite strict restrictions with photography. 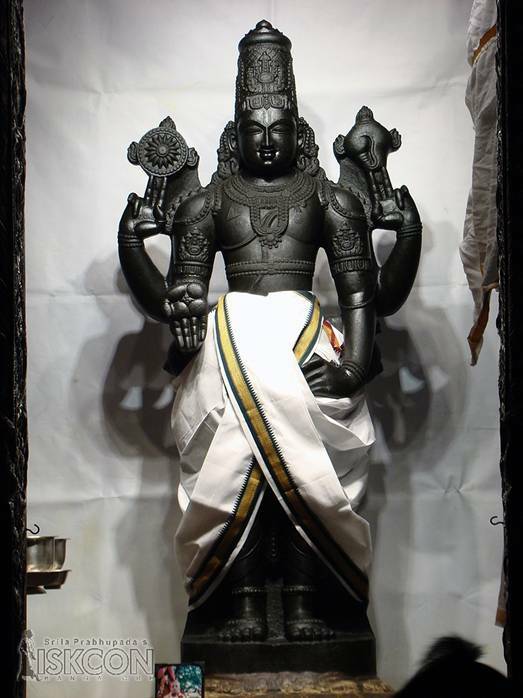 For most of you my friends, Lord Balaji is an unknown term. 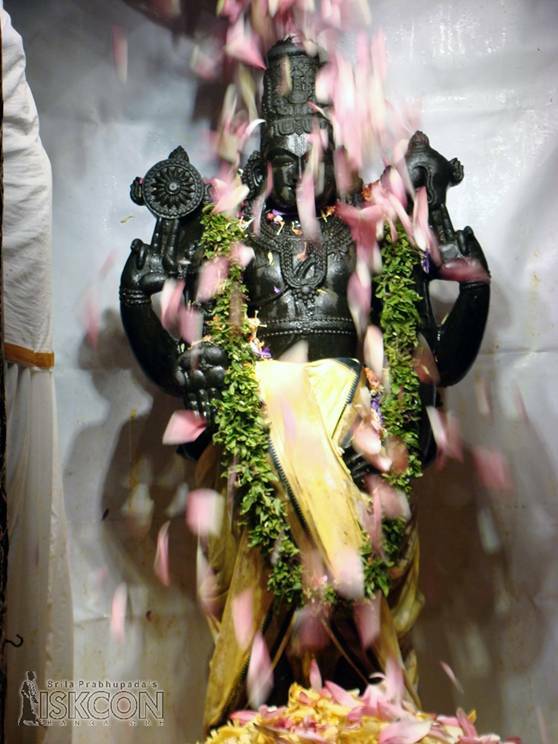 To be short and to the point, in India, this deity is one of the most believed ones! It is said that if you wish something praying this lord, visit his temple, take a glimpse of him, and give all your hair to him, your wish will come true. Enjoy these photographs to the max! This seems to be a series of step-by-step bath of the lord, and the last one being completely groomed. I don't claim copyright of these images as I have not taken these. 1. There is a watermark of ISKCON on each image. 2. In the last photograph, the small sculpture near the feet of the lord seems to be of Swami Prabhupada, who is the founder of ISKCON. Beautiful images and so colourful. Just great photos, Is taking photos your living or hobby. How intriguing! This reminds me of how in a place I once lived in the U.S., the friars in a certain mission would take down the bells in the church, dress them in clothes (yes) and parade them around the square each year, then give them a good polish and rehang them...but I do believe Lord Balaji is getting a much fancier grooming! Yes rituals in south India are very ostentatious ..... these are also means to monopolize brahmin supremacy ....Im from India.. Yes it's a protocol Lady Di Tn. I'm not sure what exactly they use to change the colors, but for sure, everything is naturally made. What an interesting ritual and belief Bhavesh. The end result is beautiful. Fascinating! A joy to get a sense of this culture and images we would never have seen. Thank you for sharing. About HDR, typically, I use 5 or 7 images by manually altering the shutter speed, (I do not use AEB). But my Basilica images were one photo. I use Photoshop to change the exposure and save 3 images for HDR processing in Photomatix. Thank you for these photos. I particularly like the mild and honey bath. Very interesting and visually stimulating. I was also interest to see that turmeric was also used. I'm a great believer in this spice. I feel like I just got my education, Bhavesh! Interesting. 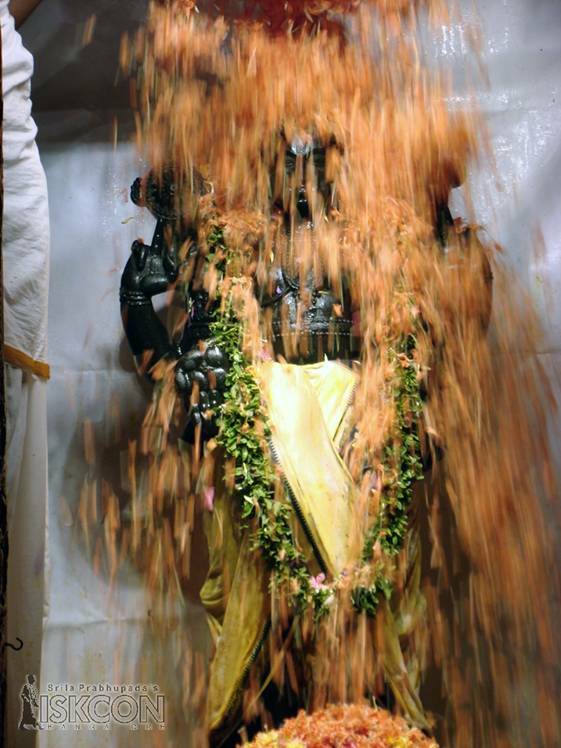 It looks as if this Lord is receiving a ceremonial bath and clothing. He looks quite festive in the last photo. What the purpose of doing so? To cherish him? 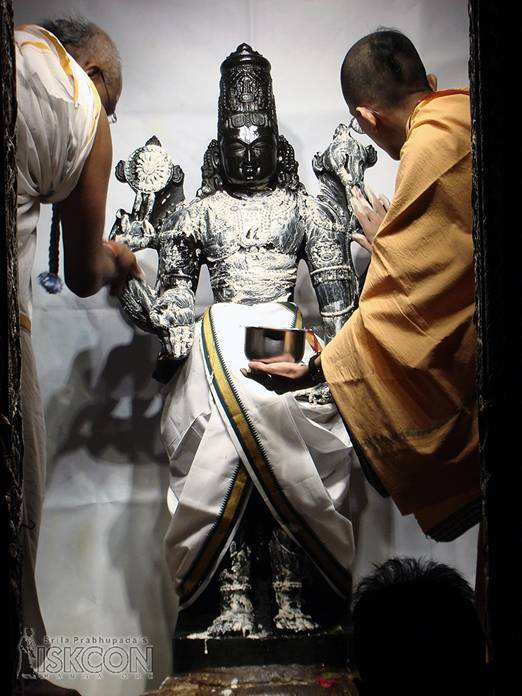 You are very right in saying, this may be from ISKCON.In Bangalore ISKCON, I remember seeing this statue. But there also photography allowed in general. Nice to have come across your blog... From the first shot itself, i felt these are from ISKCON. 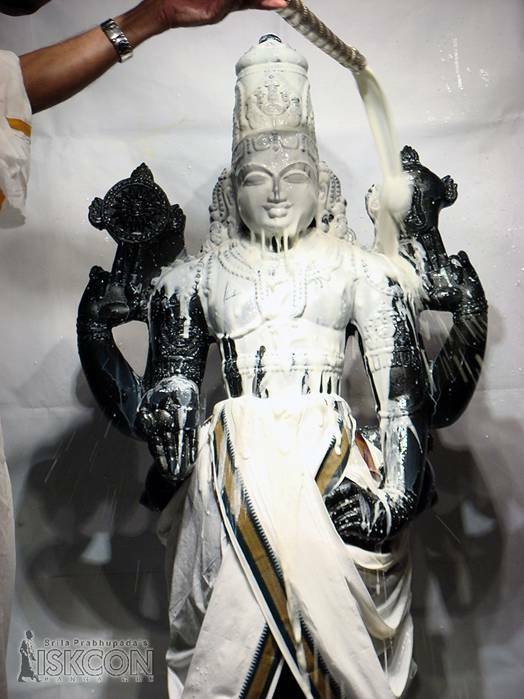 Coz Thirupathi Balaji statue is not like this. 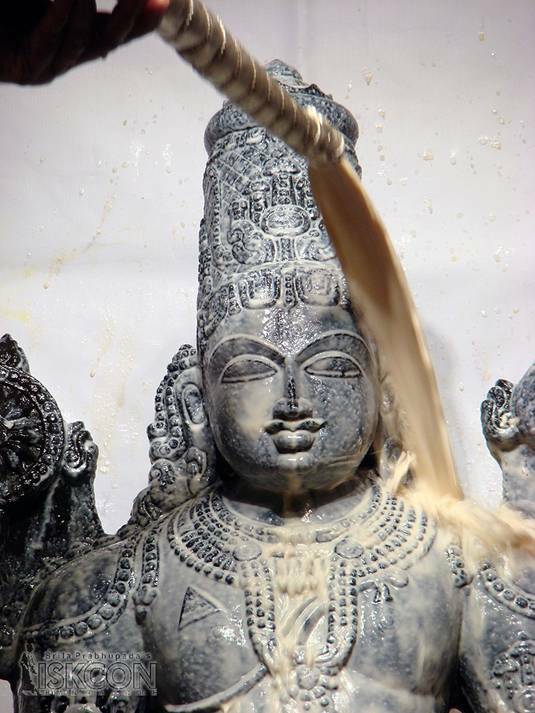 This appears too new and orig Balaji almost telld u the story of several centuries, by just a single look. 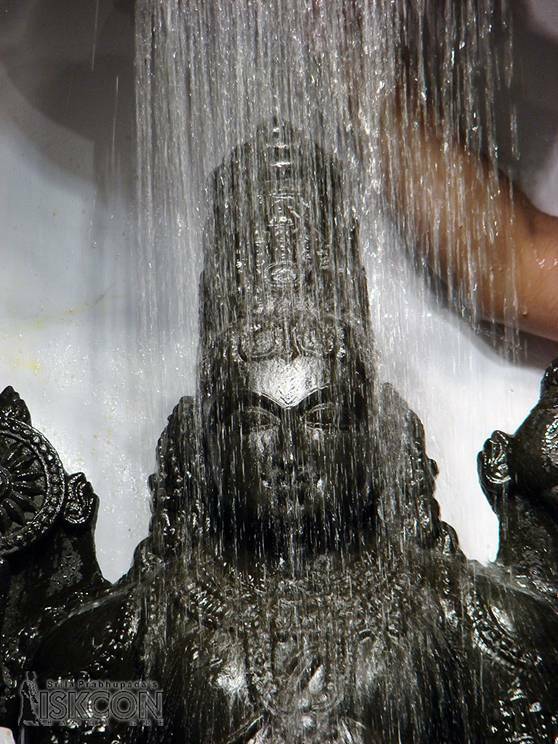 The oil and other abhishekams done everyday for several centuries are pretty much evident on the sculpture. This looks way too new. Do drop into my blog when time permits. Saw you following my blog. Dropped in to say Thanks. 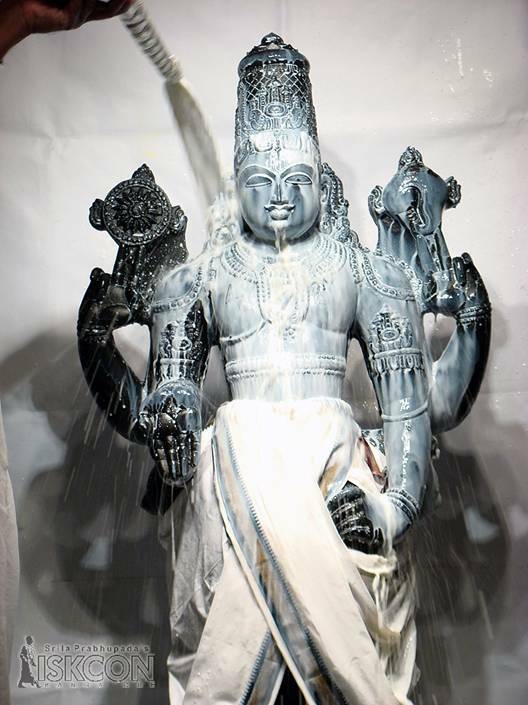 You have taken beautiful photos of Lord Balaji and also described it very nicely.Really you are a very good photographer.I have been to Tirupati thrice and would love to visit again. Thanks for sharing this! Very interesting!! I want to thank you for visiting my blog. If you have never been a parent, especially a mom, it is hard to live your life to the fullest when your youngest son cuts you out of his life and there is not a good reason for it. If there was I would try to make it right. I still appreciate your beautiful pictures so you make my life happy and I want to thank you. Fantastic series of this ceremony. Thanks for sharing ! Thank you very much for sharing these rare and incredibly beautiful images. Thank you for sharing your wonder and your amazing land with us lucky visitors, Bhavesh! You are a very good photographer and should make it your main profession. Have you thought of applying to photographic magazines, like National Geographic? You never know. Terrific series of photos, I have never seen anything like this. 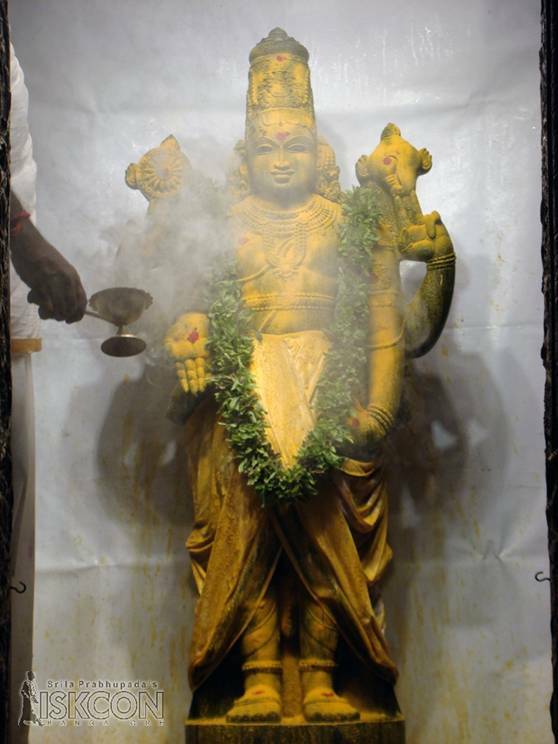 The bathing with milk and applying Turmeric powder are especially stunning. Thank you for sharing. Hey, nice effort made. These pics are very rare. 1Thanks a lot for sharing them. And yes, I had thought of giving a couple of my best shots to National Geographic, but haven't tried yet. I am still preparing those best ones. ...very interesting. The photos of the ritual are beautiful. Beautiful photos! It's always nice to learn something new. I found that to be most intriguing and most beautiful to see. Amazing to be part of viewing something so interesting of this! Thank you. Beautiful pictures, wonderful ritual. Dear Sir, I dont wanna hurt you but I dont reckon that these snaps are of Tirumala Balaji. Regards. I too believe so. 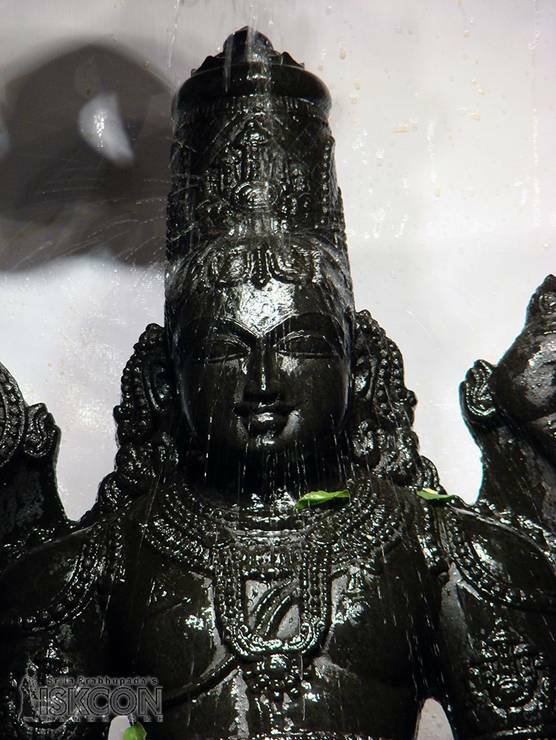 Where the post ends, I have mentioned already that I don't think these photos are from the original Balaji temple in Tirumala. Don't worry; no harsh feelings. I am son of the lord vishnu bhagwaan. I love him very much i never seen before this photos. I am very very glad heartely. 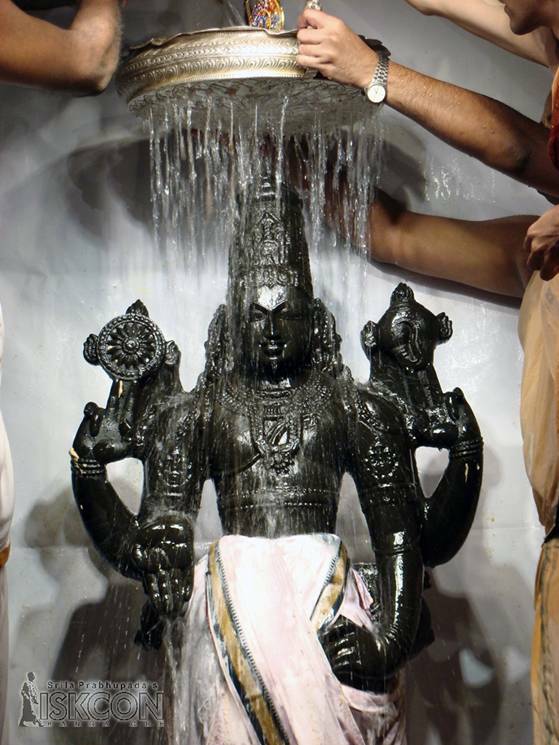 Thank You Lord Vishnu Bhadwaan. I am telling few words for you bhagwaan. @ Arun Krishan Sharma: So glad you visited and commented! Thanks for the help of sharing the nice pictures of Balaji. These are not Tirupati Balaji pictures. Tilakam is not correct. From whereever they are from though, wonderful pictures of the lord. i always love watching Abhishekams and wish that it remains in my mind when the death is near, so that Narayana is in the heart and mind while leaving for the journey. @ Anonymous: Yes, I too think so. I think these photos are from Iskcon Balaji. And I must say that your thoughts are so nice. @ sreenivasa reddy: I have to say that you have very valid points. I agree completely. In fact, I actually have some photographs that are not possible now. 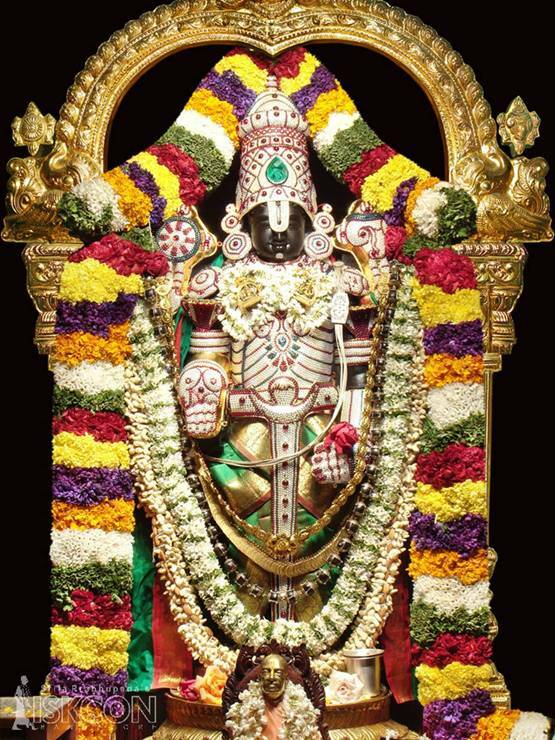 When the very first time I visited Tirupati Balaji, I was really annoyed with the rush and queue, but after Tirupati Darshan, I made my mind to come back. Tirupati is really an amazing place. This is our sacred place. I have been there 7 times. Nice post and thanks for efforts! @ Anonymous: So you're a regular visitor now! @ Anonymous: 7 times! Wo!! Do you know what they use to make their statue black. 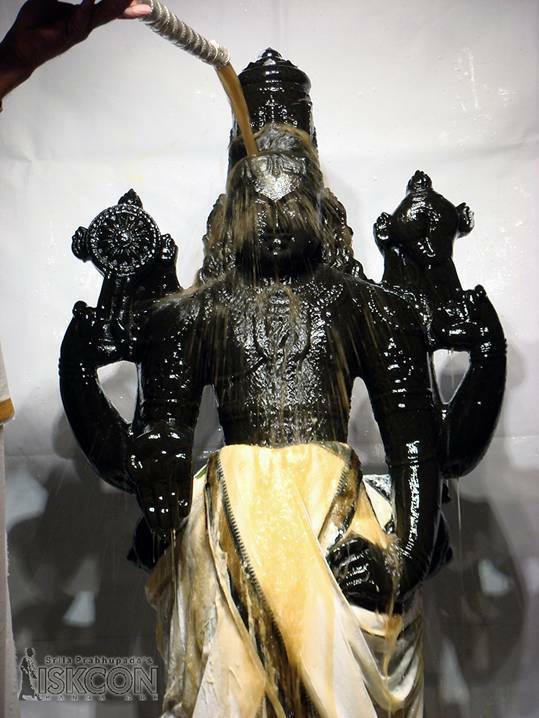 We also have a granite murthi but it is not as black and shinny as this 1. I think they use the rock from the mountains of the Western Ghats. 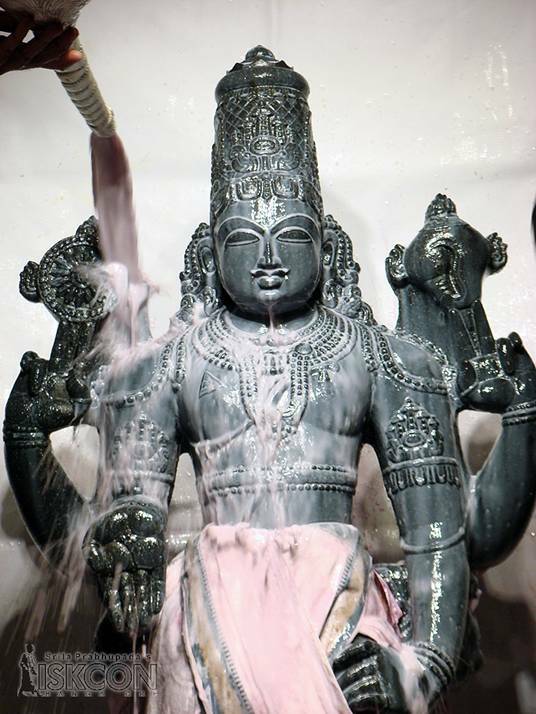 Hi I am trying to get the exact same murti in you first picture for our temple in SA. Can you put me in contact with the correct persons. EVERY WORK SE PABLE APP KA DARSHAN APNE MAN MAIN KARU. :) But they are not taken by me.